He Lives: Gladiators. Giants. Dinosaurs. Mayhem. What's not to like? Gladiators. Giants. Dinosaurs. Mayhem. What's not to like? 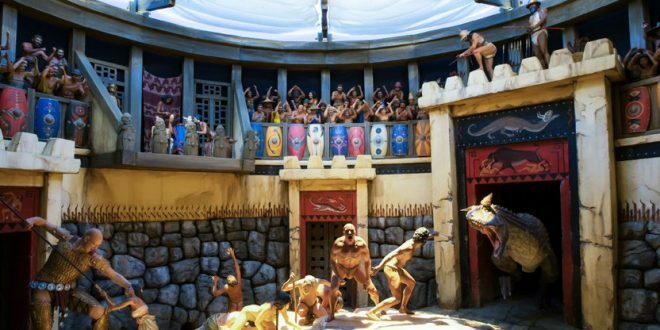 An actual diorama from from Ken Ham's creation museum in Kentucky. I guess if you are a young earth creationist then this scene is plausible. Is it with mentioning the problems associated with accepting that scenes such as this are historical and they occurred less than 10K years ago? It's not worth it, is it? Just one: does Answers in Genesis have an answer (I'm sure they do) for the question of the differences between mammoth remains (some so preserved that they are found with their last meal still in their stomach) and dinosaur remains (extreme fossils only) given that they would have been contemporaries? Did all the dinos die of some uber-virulent flesh eating disease? Still, I have to admit the diorama is awesome. It'd make a great Ray Harryhausen movie.